Carnival Vista has a whole new relationship to the sea, and you get to experience this as you explore the Caribbean with all-new views. Indoors, things are every bit as cool. Take RedFrog Pub & Brewery for example – yes, you read right, the latest incarnation of our Caribbean-cool pub has a fully-functional onboard brewery that produces exclusive craft beers you can enjoy just feet from the brewing kettle. If you do seafood, you’ll want to direct your appetite to Bonsai Sushi or the seaside Seafood Shack, while JiJi Asian kitchen and Cucina del Capitano are prepared to satisfy cuisine-specific cravings. Of course Carnival Vista features a Dr. Seuss Bookville and youth activities for all kinds of kids (the smallers, the tallers and the in-betweens). On the stateroom side, Carnival Vista adds two new types of rooms to the mix: Family Harbor is a special area reserved for families and features a private 24-hour lounge and concierge service. All Havana staterooms and suites are located just off the Havana Bar & Pool and feature a unique tropical decor, while Havana Cabanas add a patio with hammock chair! One last thing you should know: on Carnival Vista more onboard places than ever before span the indoors and outdoors – so whether you set the thermostat to “cool-and-crisp” or “sea-breezy perfection” you’ll enjoy your kind of Caribbean comfort on Carnival Vista. 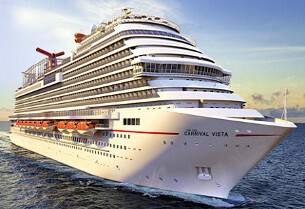 View all Carnival Vista cruises or view more options for Carnival cruises. To compare the IMAX experience to “just seeing a movie” is like calling a Carnival cruise “just a vacation.” It sounds about right… but experienced folks know better. That’s why stepping into the IMAX Theatre you’ll find on a Carnival cruise is more like taking a brief escape from life. On the other side of the amazing screen you’ll find a world of first-run Hollywood blockbusters, recent hit films and IMAX documentaries, all in a huge format that makes normal theaters look like your smartphone screen. And the very first IMAX Theatre at sea? Nowhere else but Carnival Vista. A cruise is the perfect time to treat yourself to something sweet, and Cherry On Top happens to be the perfect place. You’ll find this well-stocked candy-and-more-store not only great for enjoying some of your confectionery favorites, but the place to pick up food and apparel gifts for that special someone, even if – admit it – that someone happens to be you! Scream for the cool stuff? Visit the ice cream counter at the Cherry On Top shops aboard Carnival Vista and Carnival Horizon for a signature ice cream creation, or build your own with tons of mix-ins and topping options. And if you get the urge to eat ice cream with your hands, we won’t judge… we’ll just suggest one of our all-new ice cream cookie sandwiches. We’ll build you one by hand, and stuff it full of whatever ice cream and toppings you scream for. Let’s use our imaginations – just think what would happen if we took a normal library and put it through one of Dr. Seuss’s wacky contraptions… set to maximum fun, of course. It would probably come out looking much like Dr. Seuss Bookville, which as you can imagine, is exclusively aboard Carnival! The room is all decked out in bright colors, fun and whimsical furniture and even has some of your all-time favorite Dr. Seuss characters on the walls. But let’s not forget that this space is all about the books – the shelves are filled to the brim for hours of fun reading. A good seafood dish is quite the catch. However you like yours served – whether it’s on a roll or a platter – Seafood Shack’s the place to cast your net. Imagine a New-England-style seaside spot where you can take it all in, enjoying a great meal complete with a side of ocean view. On a Carnival cruise is where you’ll find this shack by the sea, wherever in the world you happen to be! Turn your special vacation in the direction of delicious – book a table for an unforgettably delectable evening at the Steakhouse. Our menu features mouthwatering premium cuts of beef cooked to your exact specifications, as well as a fantastic selection of seafood, entrees, gourmet appetizers and an extensive wine list. The atmosphere pairs remarkably well with – and perhaps even enhances – the culinary creations of our gourmet chefs. Tip: Like any destination restaurant, reservations are highly recommended, and can be made online after booking your cruise. Your meal includes an appetizer, salad, entree, side and dessert.